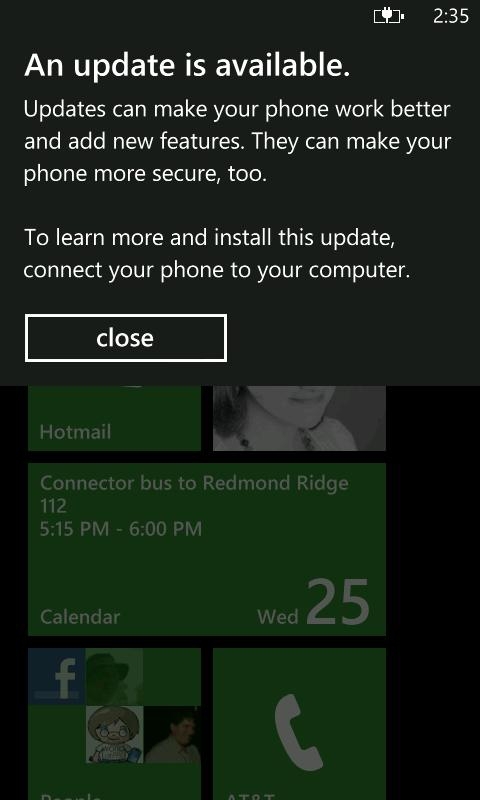 It's a story I need not go into too many details about: anyone who's owned a PDA or phone running Windows Mobile, from the first Pocket PC to the latest Windows Phone 6.5, knows the horrors of device ROM updates. Whether it's a new ROM image designed to fix bugs and enhance performance, or a whole new OS, as buyers of these devices we've always been at the mercy of the device manufacturer and/or the wireless carriers. Who amongst us hasn't raised a fist in anger at being denied a vital software update that would fix a problem with our device? This is how the entire underground ROM scene was born - out of frustration and desperation. Or, if you were "lucky" enough to have an update offered for your phone, you'd have the pleasure of re-installing and re-configuring everything on your phone; often a process that would take hours. Microsoft's broken model, combined with OEM/carrier refusal to offer updates likely drove more customers away from buying a second Windows Phone than any other factor. We could only look on with envy as our iPhone-using kin happily docked their phones, got an update, and were using it minutes later. WPT: Let's start with the best news I've heard about Windows phone 7: how will device updates work now? What will the update mechanism be? Brown: Like many other things in Windows Phone 7, we're taking a different approach to updates than we have in the past with Windows Mobile. 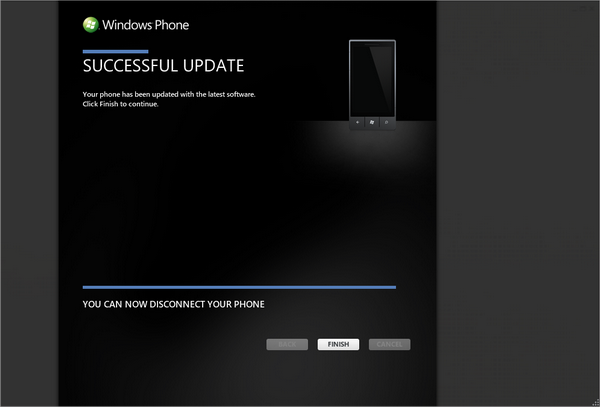 To start with, we're going to leverage the world-class infrastructure we already have with Microsoft Update today and use that to deliver updates directly to Windows Phone 7 phones - no more worries about figuring out where to go to download an update. We're also making it much easier on our partners (OEMs and Mobile Operators) by establishing a single, consistent update process that they can take advantage of, meaning they don't have to be responsible for their own individual update creation and delivery like they've had to do in the past. So it's really a win for everyone. 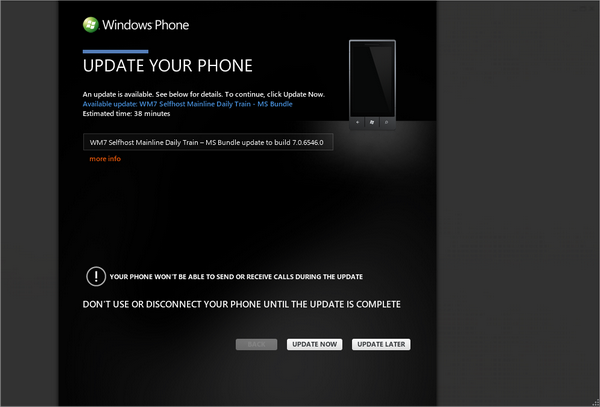 We've also built in a notification that pops up right on the phone that tells you when an update is available. When you see that, you connect your phone via USB cable to a computer running the Zune client software. At that point it's literally just one click and the update is downloaded and transferred to the phone, a restore point is created, and the update is installed, all done automatically. WPT: Gone are the days of "You do an update, you wipe everything out on the device". How does the process work now? Brown: Yes, that was very painful for users, and was one of the most important things on our list to fix for Windows Phone 7. Our new update process won't do anything to your personal data, settings, or installed apps. When the update is complete, you'll be able to use your phone right away, exactly as it was before, along with all the new benefits from the update itself, of course. WPT: The backup that's made during the update - is that a backup that the user can restore at any time? Brown: We actually don't refer to it as a "backup" because people have different ideas of what that means - in our case, the intent is very specifically to recover you back to a "snapshot" of the phone taken directly before the update, in case there are any problems as a result of the update process. To answer your question about when you can recover your phone to its previous state: the idea is that even if there's something in an update that is causing you trouble later on - maybe there's a third-party app that you really like that hasn't been updated to be compatible with the latest OS, for example - you can restore your phone back exactly the way it was before the update. In most cases, the restore point will remain on your computer so you'll be able to keep it as long as you want. 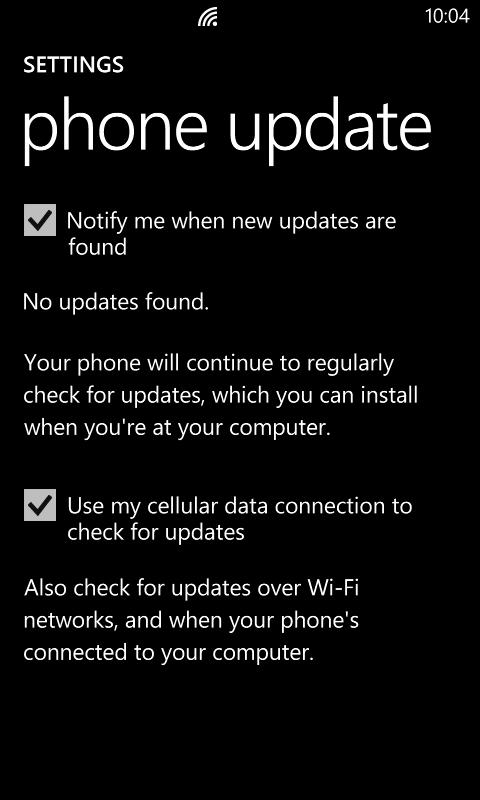 WPT: Microsoft creates the update, but does it go right to the phone from Microsoft update servers? Or is there carrier or OEM testing first that has to happen? And if that's the case, knowing the carriers the way we all do, will the process drag out during their phase? Can a carrier stop Microsoft from releasing an update? Or can Microsoft override the carrier in a worst-case scenario? Brown: In terms of who creates the update, I should clarify that Microsoft is ultimately responsible for "packaging", if you will, the update, as well as delivering it to the phone. 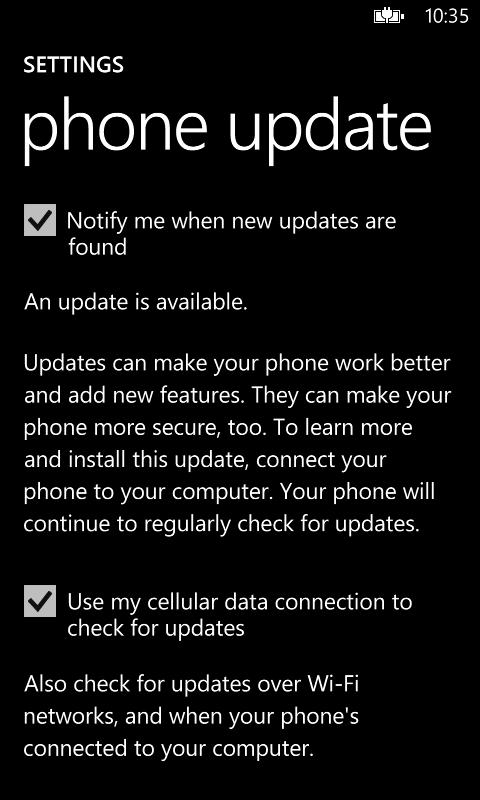 But OEMs and Mobile Operators can submit their own update code as part of an overall update that is delivered through Microsoft Update. We definitely will work very closely with our partners to make sure updates are tested thoroughly, but also released in a timely fashion, following standard practices in the industry today for smartphone devices. WPT: Let's get technical here. One of the reasons we were told the original update model worked the way it did was because Microsoft made the software, then the OEMs had to do their customization of drivers and whatnot for the hardware. We were told a hardware abstraction layer (HAL) was the only way to have Microsoft software work on a variety of hardware without the involvement of the OEMs. Does Windows phone 7 use a HAL, or is it simply that the new hardware specifications for Windows phone 7 are so exact there's no need for OEM involvement at the driver level? Brown: Our OEMs definitely play an important role in customizing each phone they develop and adding their own unique expertise, including at the driver level. But we've made it a lot easier for them in Windows Phone 7, in part by having more prescriptive guidance for some hardware specifications, and in part by doing some work "under the hood" to provide a little bit of a cleaner separation between Microsoft and OEM software at low levels of the hardware. WPT: So no over-the-air (OTA) updates then. Why not? Brown: For our first version, we really wanted a consistent, reliable solution that our customers could trust 100%. Connecting to a computer and using the Zune client software for the update gives us several advantages, including a large screen for the update user interface, the ability to charge the phone while updating, and a full backup of the phone in case any problems occur. However, we've definitely been thinking ahead as we've designed and built our current process, so we won't have to redo a lot of work in order to implement OTA capability in the future. WPT: After all of the criticism that Microsoft has taken over the years for the way device updates have worked, it must feel great to deliver a solution that will thrill customers. Any closing thoughts? Brown: Well, I'm not going to declare victory until I can come back to the community and hear everyone's feedback on how we did once we've shipped. But the great thing is that when we need to make improvements, we've now got a solid process for doing so! WPT: Thanks for your time Andrew! Screenshots of the process were also provided - check them out below. Jason Dunn owns and operates Thoughts Media Inc., a company dedicated to creating the best in online communities. He enjoys photography, mobile devices, blogging, digital media content creation/editing, and pretty much all technology. He lives in Calgary, Alberta, Canada with his lovely wife, his wonderful son Logan, and his sometimes obedient dog. He's mostly digging Windows Phone 7 so far. Bottom line: OEM first and carriers seconds are still the ones which decide if, how and when releasing updates to the customers.... at least for the time being. While I am sure that will be at least marginally better than before I am curious to see how this scenario will evolve. That's not what I read...? Bottom line: OEM first and carriers seconds are still the ones which decide if, how and when releasing updates to the customers.... at least for the time being. While I am sure that will be at least marginally better than before I am curious to see how this scenario will evolve. Um...no. That's not how it's going to work at all. While some updates will be OEM or carrier initiated - a hardware bug that needs fixing, a carrier tweak - the majority of the upgrades we'll see will be from Microsoft and for the built-in apps. I was wondering when someone was going to bring this up. I, for one, feel a lot of personal disappointment because based on that interview I was led to believe we wouldn't be in the situation we're now in with some people getting updates, some not, and there being a lot of confusion and anger at Microsoft over the state of things. Well, like many I was vocal about the prickly (as opposed to smooth) update process we are seeing. I've done most of my griping in private groups, because it just wasn't going to do anybody any good to blast the program openly. I like Microsoft, Windows Phone, and I would like it to succeed and get better. Piling on doesn't help. That said, my T-Mobile branded HD7 got NoDo last night. Got the pre-NoDo a week or two ago. AT&T Focus still waiting for either. I must say the implementation was everything promised. I got the announcement pop up in the device. It asked me to connect it to my PC and Zune. Zune told me I had an update, and offerred to apply it. It cautioned me to not disconnect and it could take some time. I clicked OK and 20 min later I had an updated device. The screens kept me abreast of intermediate steps making me comfortable stuff was happening. What I ended up with was a device configured just like I had it before the update, but with improvements. Totally painless once the anticipation was over. I gather that there have been glitches with updates, APNs changing, maybe a tile being removed (not lost), but I have had glitches myself on iPhone updates as have others. No process is 100%, but this certainly proposes to be very friendly. 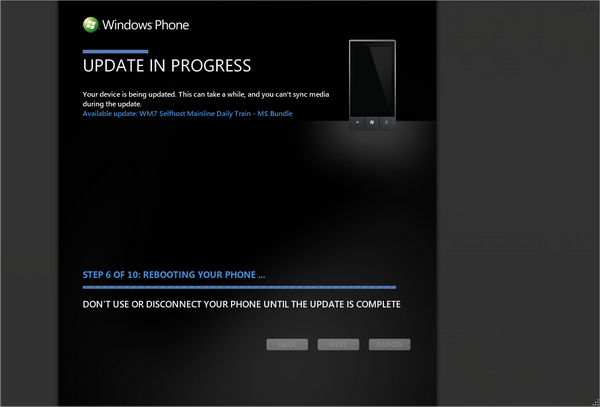 I'm pleased with the technical aspects of the new Windows Phone update capability. The bureaucratic aspect needs some work, but that is not something that MS can fix unilaterally, unfortunately. My guess is MS was not willing to sacrifice customer choice, for the power that comes with exclusivity. It's a tradeoff that in the end should see everyone with a Windows Phone, on multiple carriers in the US and around the world, having the same version. Not some of them, all of them. So, for me, if I look at my HD7, I'm pleased. If I look at my Focus, I'm ticked....at AT&T. Last edited by Sven Johannsen; 04-06-2011 at 05:18 PM.. I'va always been a bit more blunt than my friend Sven.......so here goes....I'm piling on. 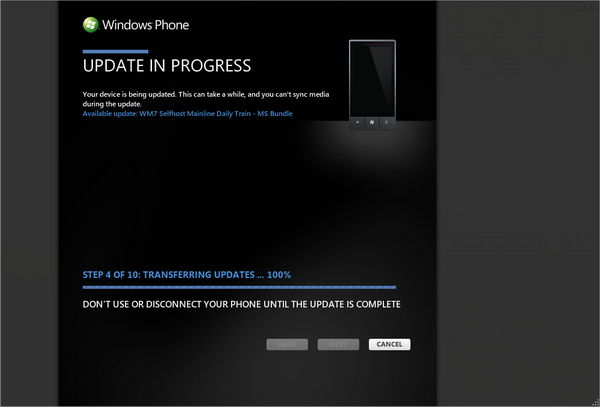 We were all asked to pay a high price to switch to WP7. We were lead to believe that having a tightly controlled platform would mean a better update process. We were lead to believe that not being able to sideload applications meant a better update process with controlled apps only in the Marketplace. We were told that OEMs, carriers, and endusers could not change the UI in anyway because it would have a negitive impact on the update process. We were told that developers would have limited access to APIs because they could then provide a better update process. We were lead to believe that doing all this would make it much easier for Microsoft to deliver updates directly to the enduser with little or no interference from the carriers. Instead we find that after all these concessions carriers still need to test the updates and sign off on them, adding weeks if not months of delays. The process is not uniform. It is taking forever to roll out to everyone. With many people still left wondering if they will even get the update. Microsoft really needed to nail this right out of the gate. Not just this update but the whole platform launch. They left such a bad taste in so many people's mouths with Windows Mobile. Many said they would never buy another Microsoft phone. This launch and update have been very closley watched by a wide audience, not just for its content, but to see how Microsoft handled it. Microsoft needed to prove to these people they were capable of managing a mobile platform. I don't think they have convinced anyone other than the already converted they are capable of producing a winner with WP7. In typical Microsoft fashion it looks like they are going to have to take 3-4 runs at this to get it right. I thought I'd check my local forums and see how the WP7 updates are going. Considering that telcos here are limited to what they can do (ie government regulations make them less likely to screw around with users), the update isn't completely flawless. 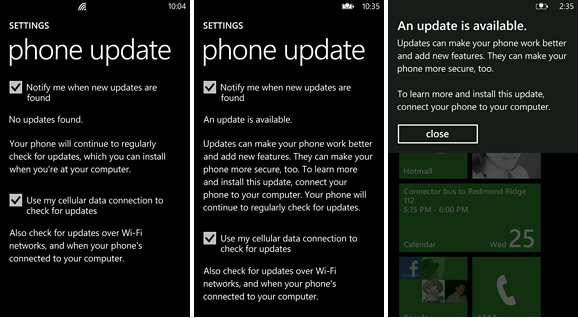 Even on the same handset and same telco, some users are reporting updates while others are not. One thing's for sure, no matter what OS you're on, it's good to have some hackers doing home brew code.